Reduces swelling, relieves toxicity, kills parasites, relieves food poisoning. Antineoplastic, reduces blood pressure and blood cholesterol levels, antibiotic, antidiabetic. Garlic Tablets contain 100% pure Garlic Acid, no sugar, sodium, preservatives or artificial color added. Double safety sealed with an outer tamper proof seal and inner freshness seal. Microcrystalline Cellulose, Dicalcium Phosphate, Croscarmellose Sodium, Stearic Acid, Magnesium Stearate, Magnesium Stearate, Hydroxypropylmethylcellulose, Polyethylene Glycol and Mineral Oil. High cholesterol, blood pressure, sores, swellings, carbuncles, tuberculosis, whooping cough, dysentery, diarrhea, influenza, rashes and itching of the skin, parasitic and viral infections. As a dietary supplement, take 1 capsule twice a day. Discontinue use of this product if experiencing any allergic reaction or other discomfort. Store in a cool, dry place. Keep out of reach of children. 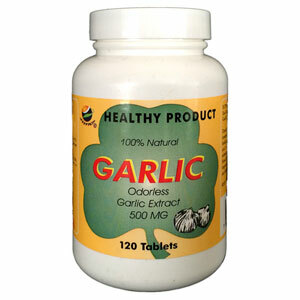 Be the first to review “Garlic Tablets” Click here to cancel reply.